One of the things about packing for a trip half way around the world that involves motorcycling is the bulk of the stuff required. The stuff I need for myself on adventurous trips tends to be a stable amount of clothing and personal items including camera and computer that tend not to vary much other than with the seasons. But a motorcycle trip requires almost a full duffelbag full of extra stuff: helmet, boots, riding pants and jacket, gloves, tank bag and a few extra nick-nacks that might be rented or purchased locally on the cheap than discarded, but you really wouldn’t want to. And yes, I could rent a helmet, rent a tent (or buy a cheap one), etc. But again, I prefer not to if I don’t have to. So I found myself at REI today, after swearing I wouldn’t enter another store during the holiday season, to purchase the green and grey Eagle Creek duffel here. 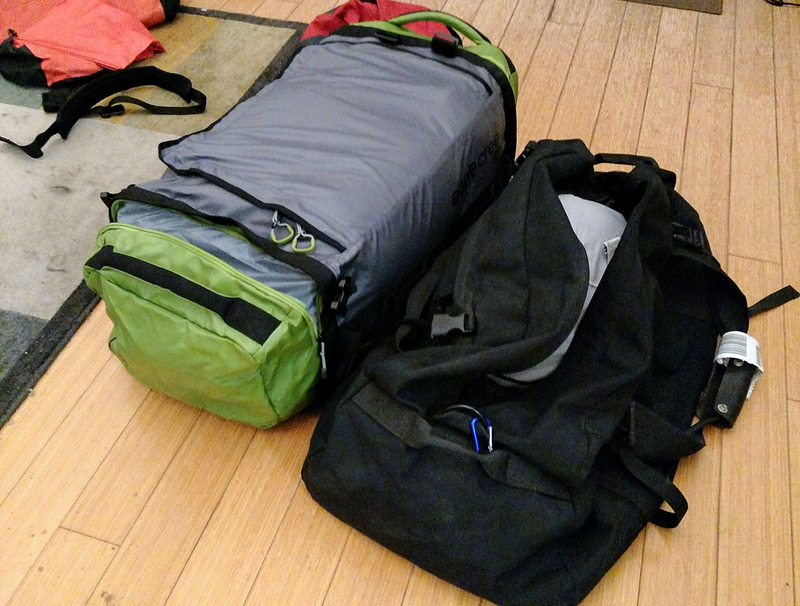 It’s almost entirely riding and camping gear, with a few bits of padding to keep things from banging together. The two duffels together hold about 180 liters and I doubt they’ll be completely full. Of that, more than half is riding gear that I wear and my tent that can be strapped across the back seat. So I think if anything the three 36 liter cases on the bike could be overkill for the amount of clothing and other gear I’ll have to pack in them. Going Air New Zealand premium economy, so my baggage allotment will cover these two duffels. It’ll be relative luxury in the aluminum tube, back-to-basics on the ground. Just the way I like it. Departure in less than 24 hours.